If you received this email, it’s because you signed up to get updates from The Alley! Our fall leagues are gearing up at The Alley in Oakland! We apologize for the late notice, if you haven't heard yet...we are actually having a fall league information night TONIGHT at 6pm. If you aren't able to make it tonight, you can give us a call or stop by to get more information on the leagues that still have space, AND the new bowling leagues that are forming! This summer has been a whirlwind! We started the kid's programs the week after we reopened from our big renovation this spring. We had over 30 children take part in our Saturday and Monday Bowling 2.0 classes, to learn some of the basics of bowling. More children's programs will be starting soon. The Monday afternoon program will continue, and we will be starting the Saturday morning program at the same time, just after Labor Day. The 8 for $8 program ($8 per week for the program, then at the end of the 8 weeks, they get their own bowling ball) will likely be starting at the same time as the fall programs. We apologize for the delay, we are working to get the right coaches, so we have the right support for the kiddos in developing their skills! The adult summer leagues also began a week after renovation, with a full Sunday night and a big Wednesday night league. It was great to see some bowlers who hadn't been bowling in Oakland in a while! This fall is shaping up to be the best season in years! We have a current list of the fall league schedule here. Through the month of August, we will continue to have our popular 'Noonlight' Bowling on Tuesdays from 12pm-3pm, so that there is an alternative to the Friday and Saturday night cosmic bowling experience! Tons of special music activated lights, music videos playing and everything aglow with our blacklights. It is a fun summer midday party! Our Thrifty Thursdays have also been well attended, and will run through the rest of the summer. 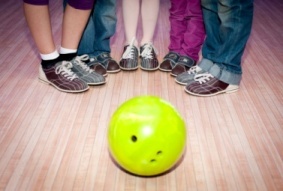 Visit us for $2 bowling games and some menu specials from Noon-5pm every Thursday through August. We continue to book tons of birthday parties, youth group outings and team building events...give us a call, if you would like to find out if we can host your next event! Tiffany & Gary AND The Alley Team! We value your feedback! Please contact us with comments and suggestions...and please let us know about your experience at The Alley!